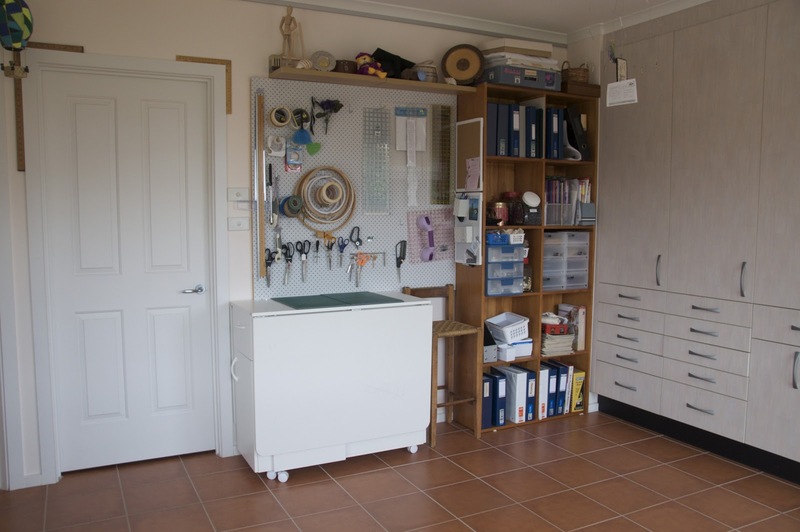 My craft room is 3.9 by 4.8 metres, with a wall of cupboards along one wall - so there is lots of room for mess. 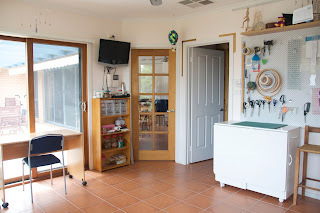 Over the years, as the mess has increased, my sewing machines and cutting table migrated to the adjacent family room, which then also became very messy - a sort-of domino mess effect. However, over the last week, we have made a huge effort and, with the addition of a sewing machine cabinet, the room is now looking unnaturally tidy, with plenty of space for the sewing machines and cutting table, even when opened out. 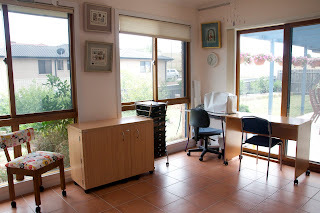 I'm now looking forward to all the wonderful things I can do in there (although granddaughter Emma has currently turned it into an art gallery). What a lovely room, so much natural light. I'm sure it won't stay that tidy for long. Have a very good 2013. Wow, what a fantastic room! I'm very envious of that wall of cupboards. You've done a great job cleaning it all up. I know exactly what that domino effect is like. My crafty stuff used to be scattered around multiple locations and was very invasive. 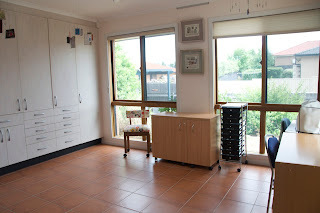 Now I have my own room, I'm hoping to keep it contained :) Happy crafting in 2013!